What is the closest non-bonding H…H distance within a single molecule? 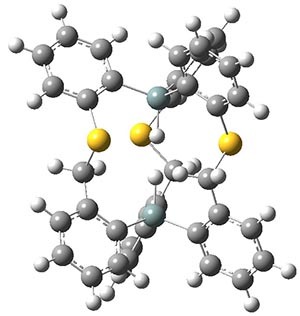 The world record had been 1.617 Å in a pentacyclodecane.1 This record now appears to be broken by the preparation of the disilane1.2 The 1H NMR and IR suggest the interior hydrogens are very close. The x-ray structure of 1 indicates a very short Si-Si distance of 4.433 Å, a distance that must accommodate two S-H bonds, typically about 1.48 Å and the H…H non-bonded distance, which might be as short then as 1.47 Å! The crystal is unfortunately not large enough for a neutron diffraction study, which would enable precise location of the hydrogens. However, computations can help here, and they suggest a H…H separation of only 1.57 Å: this is the distance obtained with B3PW91/6-311+G(2d,p), M062x/6-311+G(2d,p) and MP2/6-31G(d). The M062x/6-311+G(2d,p) structure is shown in Figure 1. Figure 1. The M062x/6-311+G(2d,p) optimized structure of 1. Any ideas for a compound with an even shorter non-bonded H…H distance? (1) Ermer, O.; Mason, S. A.; Anet, F. A. L.; Miura, S. S. "Ultrashort nonbonded hydrogen…hydrogen distance in a half-cage pentacyclododecane," J. Am. Chem. Soc. 1985, 107, 2330-2334, DOI:10.1021/ja00294a023. (2) Zong, J.; Mague, J. T.; Pascal, R. A. 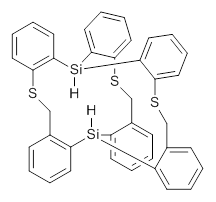 "Exceptional Steric Congestion in an in,in-Bis(hydrosilane)," J. Am. Chem. Soc. 2013, 135, 13235-13237, DOI: 10.1021/ja407398w.